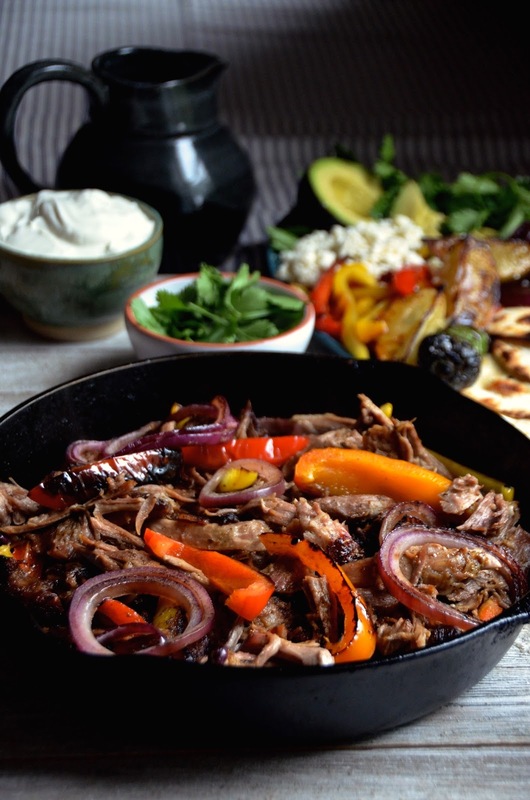 Today I’m giving you two very easy pork recipes in one—carnitas that you can enjoy as-is out of the oven, and then turn into delicious carnitas-style fajitas for a show-stopping second-day meal! This recipe is part of my continuing partnership with Smithfield. As I mentioned earlier this summer, I’ll be sharing recipes highlighting Smithfield’s variety of great-quality fresh pork cuts. Last time, we made these amazing skillet-braised pork chops with chipotle berry sauce, but now we’re moving on to my favorite part—the pork shoulder! 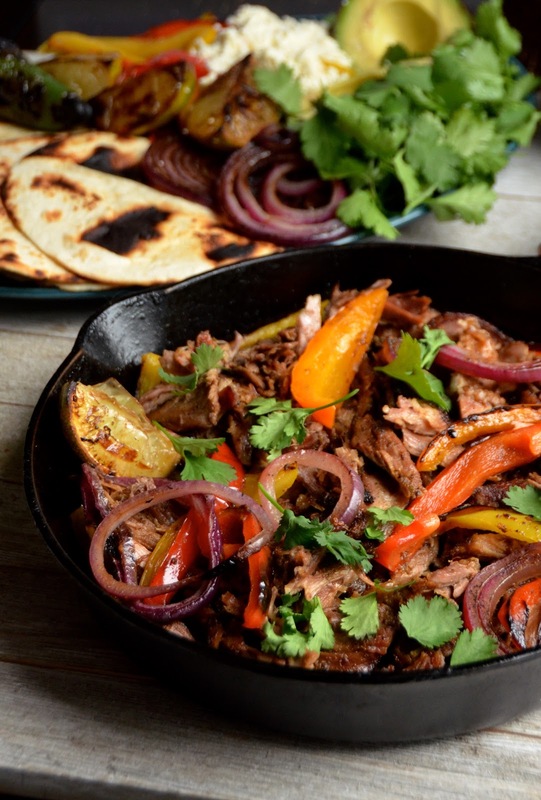 Carnitas means “little meats,” in Spanish, and is essentially a method of cooking pork that allows it to first become very tender through a slow braise, and then a little bit crisp as it fries in its own fat once all the liquid evaporates. The authentic way to make carnitas involves cooking pork in massive amounts of lard for many many (many!) hours, but I’m offering you a simplified version that you can easily make at home, which will give you great flavor with very little work on your part. You start out by seasoning the pork shoulder with an easy marinade made from herbs, garlic, onions, and fresh orange juice. To keep things super simple, I just toss everything into the blender and puree until smooth. That way you get tons of flavor, without having to do much chopping! Like all Smithfield’s Fresh Pork cuts, the pork shoulder is hand selected and trimmed of any excess fat and skin, so it’s ready to cook as soon as you bring it home from the store. If you’ve cooked pork shoulder before, you’re going to love how much prep time this will save you. Marinate the pork overnight (or at least 6 hours), then pop into the oven to braise (you can do this part in a slow-cooker too, if you prefer). I like to put it in the oven just after breakfast on a weekend morning, then go about my day. It’ll be perfect just before dinnertime, at which point you just quickly finish up the dish in about 20 minutes, and serve! It just doesn’t get any easier than this! Visit SaborSmithfield.com (Spanish) or Smithfield.com (English) for more delicious recipe ideas from fellow chefs and bloggers, tips and advice for cooking different cuts of pork, and information about Smithfield's commitment to quality and freshness. Serve with flour tortillas, sour cream, guacamole, or other desired toppings. Place pork in a large pot with lid (such as a Dutch oven) or a roasting pan. In a blender or food processor, combine the orange (yes, pith, too! ), orange juice, onion, salt, garlic, jalapeño, oregano, and cloves. Puree until very smooth, then pour over the pork shoulder, turning the pork to coat completely. Cover and marinate in refrigerator at least 6 hours or overnight. 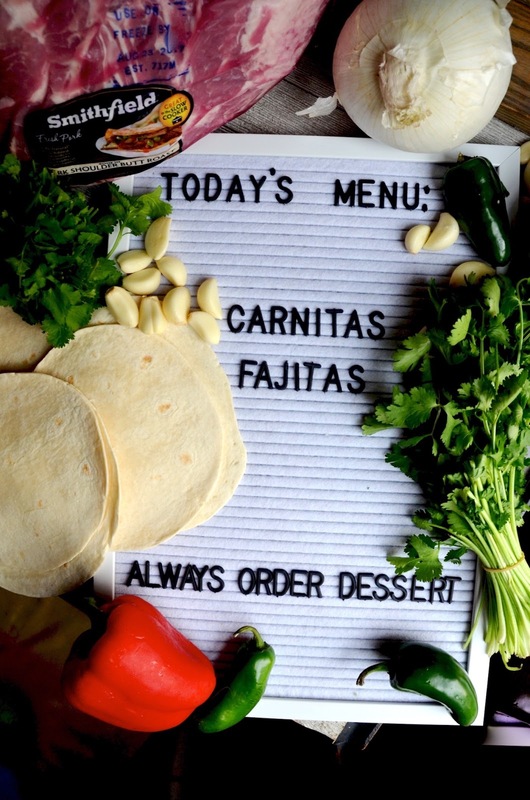 Cook the Carnitas: Preheat oven to 325 degrees. Uncover the pork and add enough water to come up halfway up the side of the pork. Add the bay leaves and cinnamon stick. Cover and let braise in oven for about 6 hours, or until very tender. Remove from oven, and shred or break pork into smaller pieces. Remove the bone and discard. Raise heat to 450 degrees, and return to oven uncovered for about 20-30 minutes, allowing the meat to crisp in the fat. You can serve as-is at this point or make into fajitas. 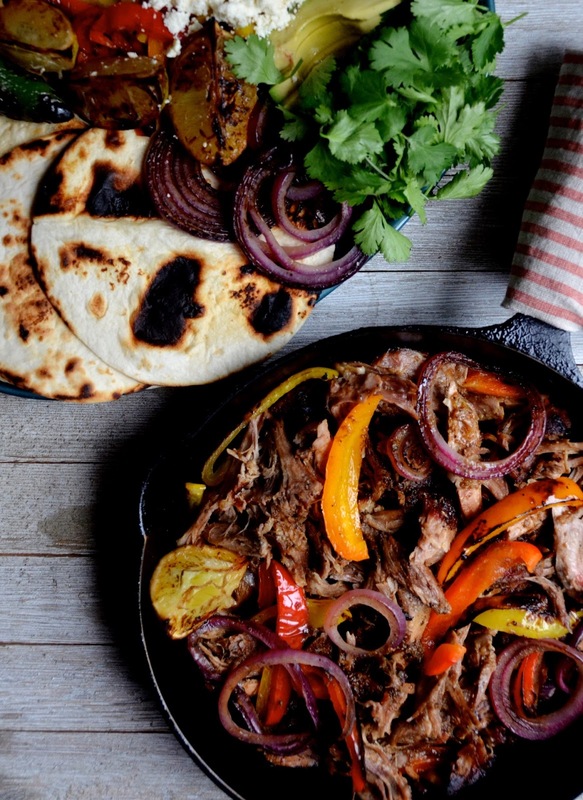 To make Carnitas Fajitas: Heat a heavy cast-iron skillet over medium-high heat. Add 3 tablespoons of oil along with the sliced peppers and onions. Allow to sizzle for 1 minute, then add a some of the shredded carnitas meat along with a scoop of the pan juices and fat. Saute until crispy, then serve hot from the skillet along with charred flour tortillas, sour cream, guacamole, and other desired toppings.